Disabled paddlers over the age of 18, and volunteers are welcome to this FREE event. 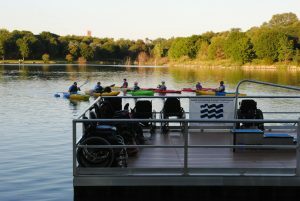 We have adaptive equipment to allow people of varying abilities to discover the joys of kayaking. NEW PADDLERS AND VOLUNTEERS ARE WELCOME!!! We will be working to get our paddlers comfortable in the kayaks, practice their strokes and customize the kayaks to meet each individual’s needs. Our team of volunteers will also be working on improving their techniques for assisting paddlers entering and exiting the kayaks, instruction, rescues, and knowledge of adaptive equipment. Please SHARE this event with friends, indicate “GOING” to the Event, and email George White at george.white@teamriverrunner.org with any questions.